As part of my retirement investing strategy at some point I need to buy a house. 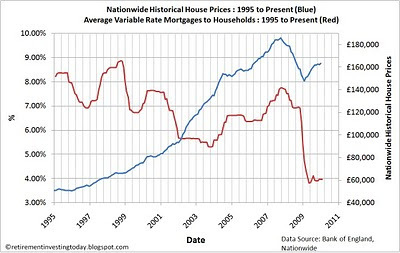 As I have mentioned before I am not currently buying as I believe house prices are overvalued. I have been looking for a data set that would show me when average interest rates charged by the banks for house mortgages were starting to rise. I was also looking for a measure that would show increases fairly quickly rather than waiting for lots of old fixed rate mortgages to expire. I thought I had found a good measure and started to see rates rising by using UK resident banks interest rates of new loans secured on dwellings to households when I blogged here. I’ve been thinking about what loans secured on dwellings means and it seems likely that it includes a lot more than mortgages. I’ve had another trawl through the Bank of England web site and found a data set that should be certainly showing very recent changes to mortgage interest rates and might be more appropriate to use. This data set is the monthly interest rate of UK resident banks and building societies sterling standard variable rate mortgage to households not seasonally adjusted (data set IUMTLMV). A chart of this is shown above. Unfortunately, unlike the previous ‘secured on dwellings’ data set variable rates are still at lows of around 4% having been as high as 8.87%. So unfortunately for those (including me) waiting for increasing mortgage rates to potentially reduce house affordability it appears we have a while to wait yet. Here’s an out of the box idea. How about the government lets the market operate freely rather than distort it with all this intervention. So where do the banks then get their money from? Another ‘crazy’ idea. How about they start paying interest rates on savings that are above inflation and that will encourage people to start saving again. Oh that’s right, that would then force mortgages up and maybe bring house prices back to more sensible levels. Let’s see if the government after the next election gives in to the banks demands. Secondly, the Financial Times also reports that estate agents have seen the first drop in new buyer enquiries for 14 months. Is this a genuine fall or due to the cold weather that we have been happening? I guess it will all show up in the house price figures in due course. That said, if I'm honest it's been good for the economy for the past 18 months that Armageddon has been averted. My median expectation is now for +/- 5% a year for the next 5-10 years, as rates gently tick up, but I wouldn't be surprised to see London boom again. Re: Your search for data, been there, got the t-shirt. You can find excellent predictors for all kinds of angles of lending and buying, then the housing market just confounds you again and again. Good luck though, it makes for interesting reading!